"ACCURATE" Thermo pack is optimum level output with some modification in combustion chamber. Radiant heat exchanger above the furnace keeps cooled. Hence, less excess air in required and which ultimately increases efficiency. Combustion air for F.D. fan passes through air preheater that absorbs the waste heat in the flue gases. It ultimately result into increase in effiency. Means reduction of infiltration unwanted air through fire gates of minimum level. 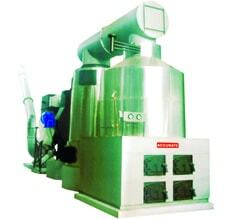 It result into maximum heat recover from air preheater and assures greater efficiency. Diesel engine keeps thermic fluid moving to avoid over heating in case of power failure. Level switch cuts off fans low thermic fluid level in expansion tank. Plot No. 7412/2-A, Road No. 8, G.I.D.C. Estate, Sachin, Surat - 394 230, Gujarat, INDIA.